Love Plus+ - A Great Attempt at "Pocket Girlfriend"
Love Plus+ is a 2010 sequel to the original "Love Plus" released in 2009. 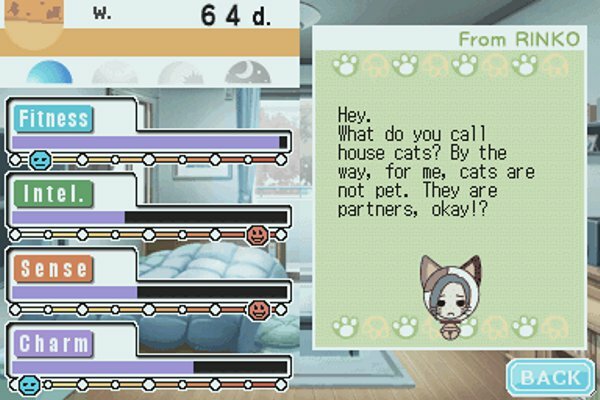 Love Plus takes the basic concepts of Dating Sims and uses the portable form factor and real-time clock in the Nintendo DS to use and essentially creates the ultimate in "pocket girlfriend" game. Love Plus+ has never seen an English release and after playing a fan translation for a couple of months, I worked up the courage to purchase it at one of my local Japanese import stores. In the beginning of Love Plus+, it doesn't exactly stand out in any meaningful way in my opinion. It's mostly a stats based grind fest early on. You can't make progress with certain girls or have any meaningful interaction with the world at all unless you're fitness, charm, intelligence, etc. reach a certain value. Picking which stats you are going to pour your precious time into is essentially how you choose what girl is going to like you and when you can activate events when you are trying to seal the deal. I should note that this is always how Dating Sims go. in my experience. and it's hard to call this a good or a bad thing. It is, after all, a computer game so of course, there needs to be a metric in which to gauge progress, but in a game that is supposed to feel like love (whatever that means...) the beginning Dating Sim segment feels all too robotic and pointless. Love Plus+ really shines with its "Real Time" game mode. After the mundane visual novel esque dating sim ends, the real one begins. You still manage your stats on a daily basis but now you can have a lite conversation, go on dates and even have skinship! Conversation works about as well as my limited Japanese allows it but I assume that it will get better the more I play and the more my Japanese improves. I can ask her questions about how she feels and her favorite color but that's about it. I really hope there is more to this and it's a feature that I will praise for its idea and presence but I can't necessarily speak to its execution. Dates are exactly what they sound like! Take your pocket girlfriend to one of her favorite local spots in real time. There is a rather large selection of places to take her and again, I look forward to seeing more of this as I play more. Skinship is everything promised if not for a bit wonky. Knowing where your girlfriend likes to be touched and when is appropriate to touch her is just about as touch and go as it is in real life and I think that's pretty awesome. My only real complaint about this feature is that it doesn't always work how its supposed to and you can really easily ruin the moment with an accidental bad touch that you never performed. Kissing is good and honestly feels really rewarding. Skinship makes up for a lot of the grind and is honestly the ultimate pay off for the game. A little video that shows off skinship and kissing in Love Plus+. Overall, I think that Love Plus+ offers a lot to the right kind of audience. I won't delve into the nebulous world of what's right and wrong when it comes to relationships but in my opinion, this isn't a girlfriend replacement so much as it is a fun release for some of those similar sexual energies and emotions. If Love Plus+ doesn't sound good to you in principle, you won't enjoy it. If you are an Otaku looking for a daily time killer, this one will do the trick. Nene is best girl, for those who care.